Energy-efficiency measures allowed St. Olaf to save 6.91 million kWh in just 2008 alone. Xcel Energy, a leading provider of energy in eight states, has recognized St. Olaf College for its efforts at improving energy efficiency. St. Olaf was included in Xcel’s “Top Ten” list for having saved 6.91 million kWh in one year and was ranked No. 1 in natural gas efficiency, with 417,840 therms saved. The college employs natural gas-fired steam, and recently installed a highly efficient (>94%) boiler at the central heating plant, helping to increase year-round efficiency. 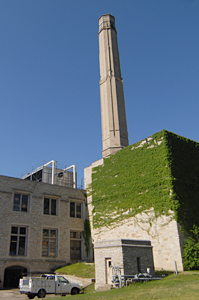 One measure of successful energy conservation is the fact that St. Olaf College’s 2008 peak steam flow was equal to the 1988 peak steam flow, even though the college had added 600,000 square feet of new space over that time. Every re-roofing project at St. Olaf includes bringing insulation and vapor barriers up to and exceeding energy code. All recently purchased appliances are Energy Star-rated. St. Olaf is the first liberal arts college in the nation to construct a utility-grade wind turbine for the sole purpose of providing energy to the campus (Carleton College was the first to construct a turbine, but the electricity it produces is sold to an energy company and added to the general power grid). St. Olaf College’s 1.65 megawatt self-generating wind turbine was constructed in 2005.